The Lord has blessed many of his people with artistic gifts to encourage and assist the entire congregation to worship him in spirit and in truth. There are many ways to serve the Lord at First Presbyterian with your artistic gifts. Making music to the Lord is one of the most joyful ways to serve him. There are opportunities for service for vocal and instrumental soloists and through the adult Chancel Choir, children’s Canterbury Choir, Student Chapel Choir, contemporary Praise Ensemble, Handbell Choir, brass and woodwind ensembles, gospel bluegrass group and various novelty ensembles. New members are welcome! The Chancel Choir provides traditional choral music in regular morning and special holiday and conference services. The choir is open to youth and adults. 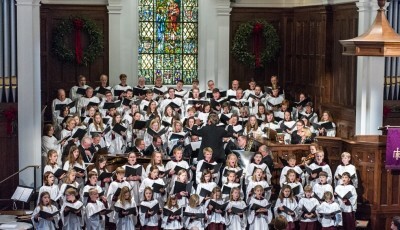 The Canterbury Choir is an auditioned group of children from age 7–sixth grade. The choir sings at selected morning and evening services throughout the year and at various community locations. The Student Chapel Choir consists of enthusiastic singers from grades 7 through 12. This choir sings periodically in the worship services as well as the annual Christmas Evensong. The Praise Team provides contemporary music leadership and accompaniment during evening services and at selected other community ministry events. The team is open to high school and adult vocalists and instrumentalists. The Gospel Choir sings bi-monthly with the Praise Team during the evening service. This choir is open to high school and adult singers. The Handbell Choir provides special music in selected traditional services, both alone and in conjunction with the choirs. The choir is open to youth and adults. Various instrumental ensembles, comprised of First Pres and community musicians, are used for special services throughout the year: traditional ensembles—brass, woodwinds or strings; and novelty groups—patriotic, jazz and bluegrass. As part of the renovation of the sanctuary in 2012, a new organ was installed by Cornel Zimmer Organ Builders from Denver, North Carolina. 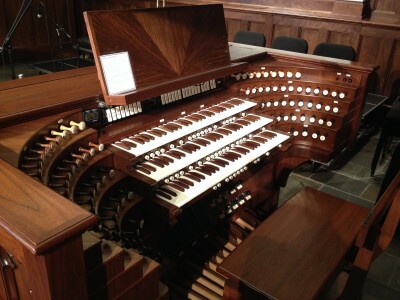 The organ has a 3 manual French style console and has 43 ranks of pipes, totaling 2432 individual pipes as well as 35 ranks of digital pipe voices by the Walker Technical Company. This is the equivalent of 4163 pipes and 78 ranks. View the complete stop list. The Visual Arts Ministry is comprised of professional and amateur artists who work in many media—oils, water colors, charcoal, photography and more—to illustrate, record, and enhance selected events in the work and worship of First Pres.